Have you ever been excited about a test? Tomorrow Jack and I are both participating in testing to move forward in our Tae Kwon Do. 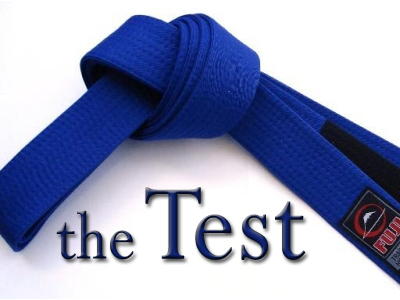 Jack is testing for his green belt and I am testing for my blue. From the tests that we have participated in and watched in the past, we expect it to be hard but we also both expect to do well. The reason that we expect to do well is that we go to class two nights a week every week. Then we practice kicks, forms and a thing called one-steps several times a week as well as stretching every day. In short, we’ve done the work so that we can be ready for the test. Wow! Now that’s a test. Did you notice that this is not a test of salvation, but rather of a believer’s WORKS. The word for works here is the Greek word ἔργον (ergon) and might be better understood by thinking of workmanship or how a person does a particular job. 1 Corinthians 3 is a picture of the coming of the Lord where we will give an account of HOW we have been serving the Lord. This test like everyone before it is nothing to be feared if you have been coming to class and doing your homework, but if you’ve been cutting the spiritual classes the Lord has put into your life then this test is the ultimate one to fear. You might say, what about grace from the last post? Remember this is not about salvation but bout an account for how we lived our lives. Those that would teach that grace removes accountability have taken it too far. Grace places us in God’s family and in God’s family like every family there are expectations of the family members. Grace will not and does not remove the accountability of being a part of God’s family, in fact it increases it! Are you getting ready for your test or are you cutting class? I have been doing a lot of thinking recently about hardship. More simply I have been thinking about the word “hard”. I’m sure that most of you will have seen the commercials by Staples that feature the “easy button”. Remember it’s the button that takes something really hard and magically makes it easy. It occurs to me that “easy” and the pursuit of it is at epidemic proportions in our nation. Have you ever thought about why “hard” has become so vilified while “easy” seems so virtuous? To prove my point think about how we categorize things that come to our lives. For the most part everything that we consider easy is good and therefore part of God’s blessing in our lives and everything hard is bad and is either a result of sin or a direct attack from Satan on our lives. And yet throughout the scriptures as well as the experience of our lives the best things in life are hard-fought. Some of the things I am most proud of came at great effort and sacrifice. My time in the military was filled with challenge and things that could only be categorized as hard. I value them deeply today. Through hardship we grow strong, we develop character, and we learn discipline. Therefore, I am starting a new habit. Do something hard every day. Find something no one else wants to do and do it! If the world is going to be reached for Christ in my generation there are going to have to be some people who are willing to look a hard thing right in the eyes and with determination and intent launch into it. Rather than look for the easy, look for the hard. It won’t be hard to find. It will be the thing sitting all by itself while the crowd is gathered around the easy thing. God, like the United States Marines is looking for a FEW GOOD MEN and WOMEN who are looking for something hard to do! This entry was posted in Self Discipline. I heard a great explanation early this morning that I thought I would share with you today. Have you ever been a little confused about the whole Old Testament Law versus grace discussion? The reason that this is a particularly interesting topic to me is because there is a church not far from ours that believes and teaches that there are aspects of the Law that we as Christians should adhere to very closely. They believe that if you do not keep the feast days as well as the Sabbath regulations then you cannot please God. In essence they have combined Christianity and Judaism. Are we still bound by aspects of the Old Testament Mosaic Law? What did Jesus mean when he said that he was not getting rid of the law but fulfilling it? Consider a mirror. In fact, Jesus even used the metaphor of a man looking in the mirror one time. In reference to your face being dirty, you go to a mirror to find out. 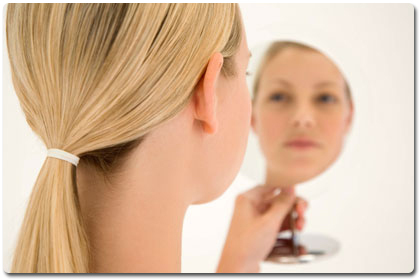 You look in the mirror and it reveals to you the dirt on your face, but you don’t use the mirror to get clean. In similar fashion the law can point out what sin is, but it can do nothing to remove that sin. Jesus does that and that is what he meant when he said that he was fulfilling the law and one who is clean has no need of the codes and ordinances of the law! It feels great to be clean doesn’t it? This entry was posted in Bible, Grace and tagged Grace. Today I had the opportunity to be engaged in a very good conversation about which version of the Bible a Christian should study. If you ask around you will quickly find out that there are as many opinions on this subject as there are versions from which to choose. Before I answer that question, let me jump way out on a theological limb and poise another more seminal question. Upon what does God’s anointing rest? Is the anointing upon the letters printed on the page? Does the anointing only start when those letters form words? Do those words have to be in the form of sentences or perhaps verses? Is the word “power” anointed? If I say, “I need to pay my power bill.” Is the word still anointed? You might think that I’m being ridiculous but when does a word become “God’s” word. The answer is: When God says it! The anointing lies in the speaker and the context. Take God’s word out of context and it looses it’s anointing because it’s no longer His word but someone else’s. Said more simply, when the story is retold is it told accurately? Is it possible to retell a story using different words and be accurate? 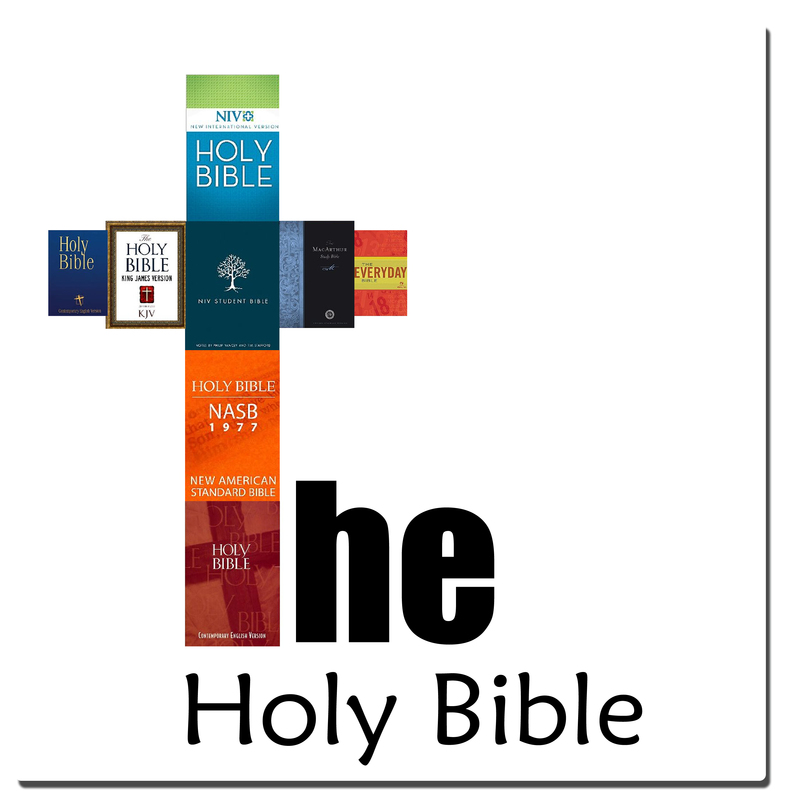 I believe that it is, therefore I have no difficulty with versions of the Bible that stay accurate to the original manuscripts and yet use more modern, easier to understand English than the King James version of the Bible. For those who would argue that the King James is more accurate in its interpretation I would like to offer this…. What, you mean you can’t read New Testament Greek? Here let me translate that verse for you. That’s Acts 1:8 from The Message a transliteration. Now which would be better, not understanding at all or getting the story accurate. The words are not exactly from the original manuscript but the story IS accurate. If we mandate the King James there are those to whom it is as foreign as the Greek was to you. I can’t believe that this would be pleasing to God. However, as a guide to accurate translations, consider the chart below in your decision making process. I use the ESV most often, as it is a very accurate translation of the original manuscripts (even more word for word than the King James) and yet easier for people to understand today. I was thinking this morning about aspects of life that lead to success. What are the ingredients that fill the lives of those who seem to always end up on top? While these lives get their share of hardships and trials, they seem to always rise above these things. The difficulties that seem to push others down push them up. As I thought about these things a verse of scripture came to mind. 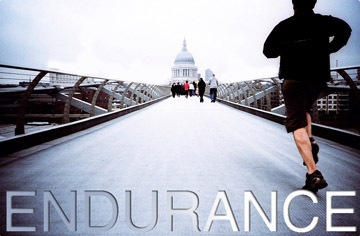 Endurance, is also called perseverance. It’s a quality that frankly I see less and less often. It’s that quality that says “I won’t quit!” The quality in a person that even when the body is tired and the spirit weak they hang on anyway. I’m not sure and I can’t prove it scripturally but I think that at times the Lord pushes us well beyond what we think we can handle. Isaiah 40:31 says that those who wait upon the Lord have their strength renewed, but it doesn’t say how long the wait is. Sometimes when I read that, the picture that comes to mind is that the moment fatigue begins to be felt, the Lord rushes in with a fresh amount of strength. The experience of my life and in the characters that I read about in the Bible, is something more akin to us hanging on to the rope above the deep ravine until just the second prior to our grip completely failing us then the Lord comes and refreshes us. Then the next time we find ourselves being taxed we can hang on longer. Always growing, always increasing. Also I see the Lord whispering in our ear, “Come on… you can do it… push a little harder, push, push, push! I have no doubt the Lord knows better than us how much we can do and intends that we find out! Read the next verse in Romans 5 and see what the end of this endurance is…. This entry was posted in Walk the Talk. Well this is the last night we will be in Europe and tomorrow we fly home. By the time you read this we will be somewhere over the Atlantic headed west. It has been an incredible trip. In the days to come I will continue to introduce you to some of the things we saw and some of the wonderful people that we met. Let me close this last session from Europe by taking you on a trip that I made several years ago. Many of you will have never visited the memorial to the officers and men who gave their lives at Pearl Harbor. On two different occasions I have been privileged to stand on the memorial that is positioned above the U.S.S. Arizona in honor of the 1,177 men who gave their lives on December 7, 1941. It is hallowed ground on which I am always moved to tears. 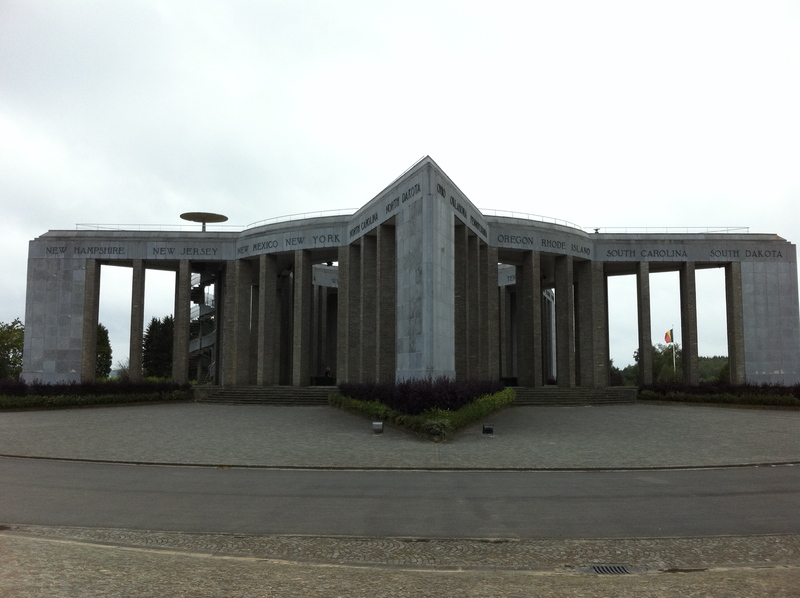 Today I had a similar experience when I visited Bastogne the site of the Battle of the Bulge and a place where the American forces suffered 89,000 casualties including 19,000 killed over a six-week period in December 1944 and January 1945. Men paid an incredibly high price that you and I might be free. Had you or I been either at Pearl Harbor or at Bastogne I doubt that we could ever forget the price that victory and freedom demanded during those days. And yet we forget. In fact, our nature demands that we return to carefree days as soon as possible. Something happens after enough time has gone by. We lose sight of the things that really matter. We do the same thing with the Lord. We forget his sacrifice, days without number. The verse in Jeremiah uses the picture of an approaching wedding as something greatly anticipated, something no one could forget. That’s how we are to remember and look forward to our bridegroom, with baited breath, unending anticipation, and racing hearts. Just like my visit to these military monuments, we should have tears in our eyes and pride and honor in our hearts as we remember the sacrifice made so that all of humanity could know victory and freedom. Let’s do our best to never forget! Today I we saw a phenomenal example of what a single God-given idea can do. The house in this picture is the headquarters of a ministry that you can find at www.jesus.net and it was an idea birthed through a new friend of mine named Eric. In 1999 the internet was just beginning to take hold here in Europe and God placed an idea in the heart of Eric to use the internet to reach out to people across the world for Jesus. At that time there was not a single church-based site on the whole of the net. It seems to us as if the internet has always been around but really it had just begun in 1999 as it had only been released for commercial use in 1995. Anyway, Eric had this idea to build a site where people could learn about Jesus and find discipleship ideas that could help them in their growing faith. That initial website was in French and had the name “top Christian” or “cool Christian” (English translations of the French name) and it was pretty much just Eric working from the church he was pastoring. A lot of people thought that Eric was wasting his time trying to use this new technology for the Kingdom of God and as such support was almost non-existent. But this was a God idea, and miracles always follow God-given ideas. Today, 12 years later, that initial website is now offered in 23 languages and if you go to the site you can watch in real time as people from all around the world indicate that they have made a decision to follow Christ. What can a God idea do? Since it’s release 2.5 million people have indicated that they decided to follow Christ because of the website! That’s what a God idea can do and He’s got more of them! I believe He’s got one for you!